This weekend was spent at the Old Dominion Stunt Kite Competition at Dorey Park in Richmond, VA. We had never been to one before and wanted to see what constituted a stunt kite competition and renew friendships with some people we hadn’t seen in a while. While we were warned that the competitions could get very boring and had prepared a back-up plan if needed. It turns out, we never left the park. The competition is divided into two types; precision and ballet, and is set up for dual and multi-line kites on three levels; novice, experienced and masters. Also there is competition for pairs and teams to fly. Apparently, they have changed the precision competition rules and, instead of just doing figures, the flier must tie the figures together with transition moves. This makes it more of a fluid routine and makes it less boring because it not just the same thing over and over and over. Of course, the ballet routines are never boring. The choice of music for a ballet routine is as varied as the style of flying. The winds were a challenge all weekend. No wind, then some wind, then no wind, then some wind, etc. And rain on Sunday made things even more interesting. The competition kept on, even in the rain. 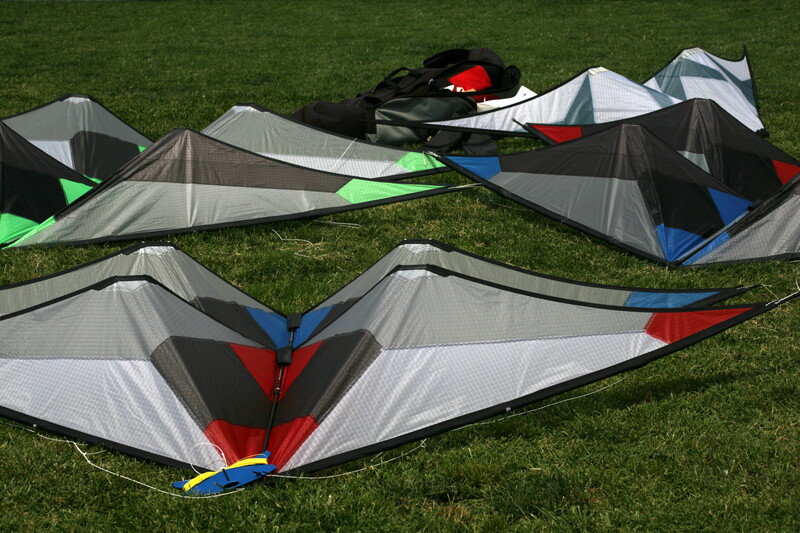 There were a fair number of kite builders in attendance. Most were competitors as well as builders. I had several conversations with them and shared a couple of the kites I had made. And they shared theirs. We talked sewing techniques and ideas and I learned quit a bit. I also got to meet people who I had only known from the online forums and found out their true names. It made me feel like I was a part of something and not just a faceless voice on a computer screen. I’m finding that sharing brings us all together. No matter where we come from. One person in particular was trying to get me to tell the secret pattern of my current kite build. It’s not going to happen. The secret will be revealed in due time. I tried to put up a couple of single line kites over the weekend. Between the two days, I’d say I got maybe a half hour of flight time with about three different kites. Two were kites I had made and one was the Chiroptera I won in the raffle. 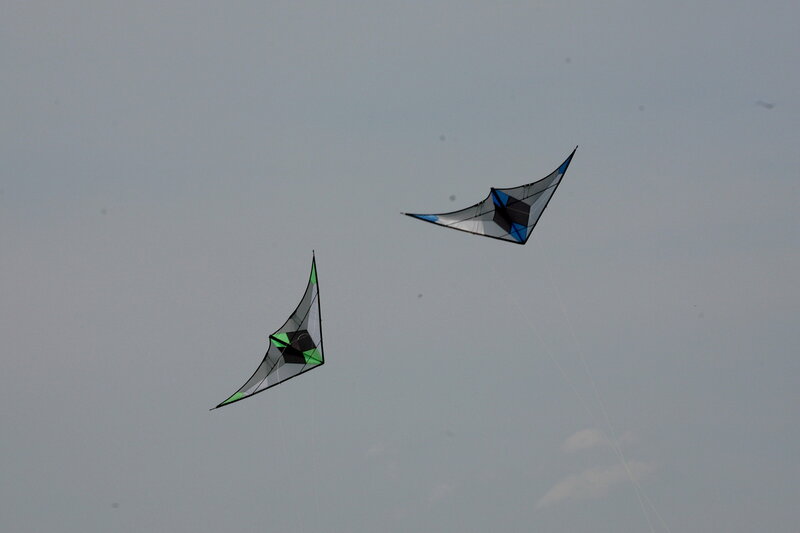 So for two kites there wasn’t enough wind and for the one there was too much. I had wanted to fly my Vamp Devil but I never took it out of the bag. If the pros were having trouble keeping their kites in the air, what hope did I have. And, at times, the competitors were having trouble. One of the great things was that even though these fliers were serious about winning and earning league points so they could advance in the standings, they weren’t above laughing at their mistakes and enjoying the time together. As this was my first competition event, I can’t say whether it is this way at all the events. I sure hope so. By the way, I was informed that as I did manage to fly a kite at Dorey Park I was now considered a member of the Richmond Air Force, the local kite club. I think this decision was made so I could be drafted to help tear down the field equipment at the end of the day. I have to admit, I didn’t put up much of a fight. Many hands make light work. Saturday night was a cookout at one of the local kite members house in the country. What a special place. And what great food. The awards were given out for the first day’s flying. And there was an auction for some kites that were donated to raise money to help fund the competition. I stayed out of the auction as I had already received a new kite. I had gotten the Chiroptera, the raffle kite, that morning from the builder. He even signed the kite for me. The party broke up about dusk as the next days flying was to begin early. Sunday was Father’s Day. We got to the field late because we had a special Father’s Day breakfast. And John got to open a Father’s Day present from our daughter. It was a figurine of Charlie Brown trying to fly his kite. The inscription on it was “Believing Is Halfway to Flying.” So appropriate. He as thrilled. We got our canopy set up and talked to a few people when he got another Father’s Day surprise. The dog got him a red Vamp Devil. Now John has never flown a quad line kite so he was in no way expecting one. Especially from the dog. But he wanted to show it off so we hung it on the back wall of the canopy so everyone around could see it. And it’s tail billowing out behind it whenever the wind came up. It caught a lot attention from people who had never seen one before. Hardly anyone realized it was a quad line until we told them so. And then the rains came. We stayed dry under our canopy and gave shelter to several kite bags. The Vamp Devil was put away so it wouldn’t get wet. The rain was heavy at times but not steady. At the coast we would call it “coming in squalls”. And of course, it quit when it was time to give out the awards and pack up for the day. Then it was off to a restaurant for a Father’s Day dinner. A place of John’s choice for a dinner of his choice. Well, really his second choice. The first one was crammed and the waiting line was out the door. This morning we slept late and took our time coming home. Made a couple of stops on the way and still got home in good time. Did we have a good time? Yes! Will we do it again next year? Most probably. The pressure will be on for us to fly in the novice class. We have been warned.